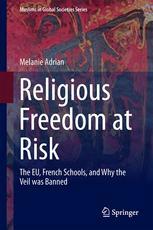 This book examines matters of religious freedom in Europe, considers the work of the European Court of Human Rights in this area, explores issues of multiculturalism and secularism in France, of women in Islam, and of Muslims in the West. The work presents legal analysis and ethnographic fieldwork, focusing on concepts such as laïcité, submission, equality and the role of the state in public education, amongst others. Through this book, the reader can visit inside a French public school located in a low-income neighborhood just south of Paris and learn about the complex dynamics that led up to the passing of the 2004 law banning Muslim headscarves. The chapters bring to light the actors and cultures within the school that set the stage for the passing of the law and the political philosophy that supports it. School culture and philosophy are compared and contrasted to the thoughts and opinions of the teachers, administrators and students to gage how religious freedom and identity are understood. The book goes on to explore the issue of religious freedom at the European Court of Human Rights. The author argues that the right to religious freedom has been too narrowly understood and is being fenced in by static visions of Islam. This jeopardizes the idea of religious freedom more broadly. By becoming entangled with regional and domestic politics, the Court is neglecting important nuances and is jeopardizing secularism, pluralism and democracy. This is a highly readable and accessible book that will appeal to students and scholars of law, anthropology, religious studies and philosophy of religion.